Danish intelligence uncovers a three person (one Dane, two Tunisians, all Muslim) murder plot aimed at killing the cartoonist parodying the violence advocated in the name of the Prophet Mohammad. A commitment to our First Amendment, related principles, and democracy is independent of all behavior animated by any religion, which is so last century. Avenging an entity you simultaneously assert is omnipotent is disjointed, at best. Excellent, fight speech with more speech; not walk out because you disagree with another's speech! Morsi's free speech concept appears to be significantly stunted—perhaps the result of a lifetime spent enduring and fighting oppression? Morsi will need to significant broaden his free speech concept if he's to lead Egypt in a modern world—telling a modern world that you support free speech to the extent it's edifying is to confess your disdain for free speech. Charlie Hebdo published Mohammed cartoons mocking the religious extremists' expression of murderous outrage in response to an earlier YouTube trailer, Innocence of Muslims mocking the Prophet Mohammed. Political leaders worldwide have spent the last two weeks obsequiously responding to the religious extremists' expressions of murderous outrage and implicitly circumscribing expressions of speech, if not expressly calling for its censorship. Others have asked a French court to retroactively enjoin the already published Hebdo cartoons to likely futile effect. The Prophet Mohammed and all his "followers" will just have to learn too endure the same criticism and mocking endured by all deities, which have dominated the minds of men over the ages—the sooner the better. 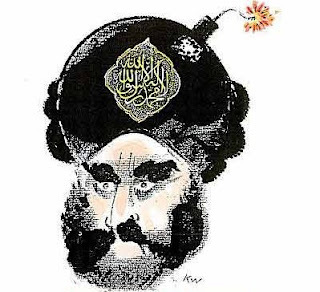 Is this some sort of clever Danish terrorist sting operationpublish cartoons making fun of Mohammed and arrest the religious extremists as they stream across the border in pursuit of the cartoonist? UPDATED 01/01/2010 UPI, Intruder at Danish cartoonist''s home shot and BBC, Somali charged over attack on Danish. Another unbalanced immature assassin triggers republishing of Mohammad Cartoons.